How do you follow Mr. Rogers? Well, you don’t, really. Which helps to explain PBS’s decision to move to an animated tiger as the leading host and tour guide of the Neighborhood of Make-Believe. 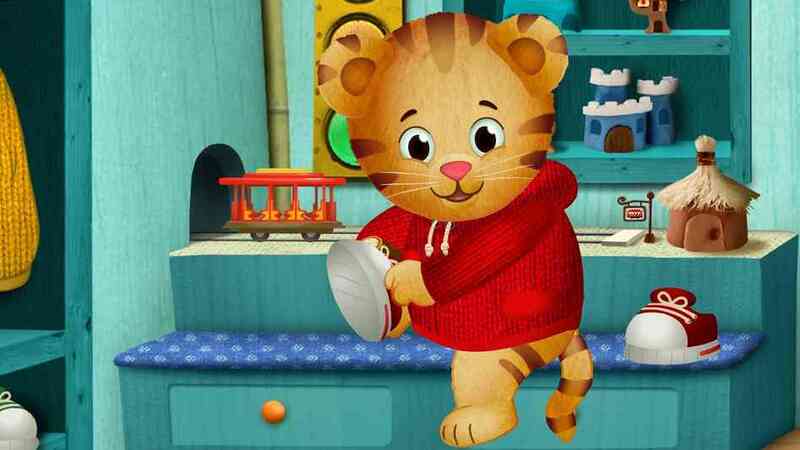 It’s not uncommon for my two-year-old to answer Daniel Tiger’s questions and comments, which Daniel puts to the viewer in much the same way that Mr. Rogers did. Best of all–there’s a soundtrack for the show. This has a noticeably positive effect on our two-year-old and his assessment of life in the early morning, without having him in front of a screen. Nearly every morning at our house now begins with a collective listen through this album. The music is catchy! I have to try really hard not to sing these songs to people around me. The big hit lately around our house has been these printable pages of the characters in Daniel Tiger’s Neighborhood. Unfortunately, my quoting, “When something seems bad, turn it around–find something good!” doesn’t always work for my two-year-old when he’s really grumpy. But it’s hard being two! And Daniel Tiger seems to get that, keeping a positive outlook throughout all the vicissitudes of toddlerdom. Thanks for bringing Daniel Tiger to my attention. This brings back the same feelings I had when Captain Kangaroo came to end in 1984. I was in 1st grade or entering the 2nd at the time. At, least this time they have a replacement. I am thankful that there are still some wholesome shows for Children out there. Sure thing! It’s a good one. I love daniel tiger it is a great show for my kids. but i got one question what does uga muga mean? It’s what Daniel says when he wants to tell someone he loves them.